Gold has been discovered in the sleepy village of Old Town. Things have been crazy ever since! Infected by the gold rush fever, everyone is grabbing sticks of dynamite and throwing them into the gold mine. Now you need to be fast and have a good eye ... otherwise you'll go home empty-handed! 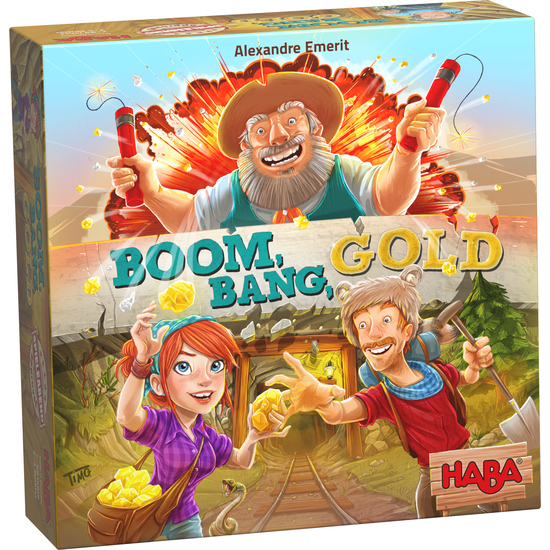 Contents: 1 gold mine (box base with 2 inserts), 4 characters with gold chests, 4 sticks of dynamite, 4 shelves, 1 pocket watch (lap timer), 160 tiles: 82x boulders, 35x legal gold nuggets, 35x illegal gold nuggets, 4 special tiles (1x bat, 1x snake, 1x rat, 1x ghost), 4 action tiles (1x pick, 1x dynamite, 1x revolver, 1x sheriff's star), 1 set of instructions. Short game instructions: • Place the box base in the center as a gold mine. Place all tiles face down into the gold mine. • Choose a game character and take a stick of dynamite. Each character is protected against a particular special tile. many gold and action tiles as possible. • The special tiles slow down the other players. The action tiles provide benefits to the player. • Stow away the collected gold! The player who has collected the most gold after 12 rounds (see pocket watch) wins.